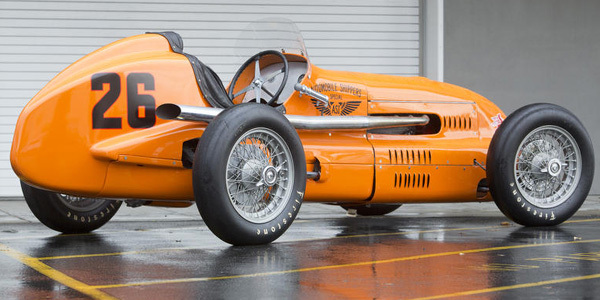 The 1948 Auto Shippers Special represents a milestone in the evolution of American open wheel race cars, the pinnacle of the upright sprint cars that raced...everywhere, on dirt, pavement and bricks, from Indy's 2 1/2 mile expanse to tight bullrings in the hands of drivers with legendary skills, courage, sensitivity and reactions. It embodies Bill Schindler's talents, a driver who could make a frog look like a prince, seizing the best from machinery, tracks and opportunities with modesty and good humor. It is a driver's car, driven at Indianapolis by one of the best drivers of the era, Bill Schindler.